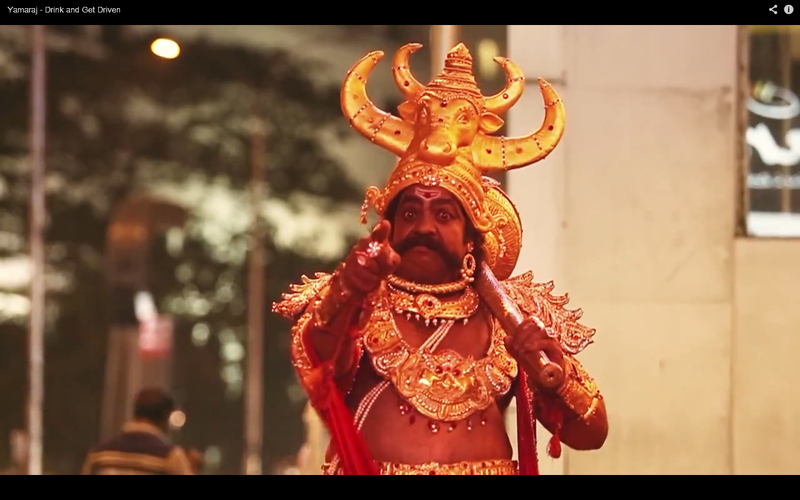 Viral Video: Yamraj says "Drink and get driven"
How many times have we seen the posters “Don’t Drink and Drive” at every corner of our city and yet we citizens fail to follow a simple rule. The foremost reason for 70% accidents in India, drunk driving is a serious concern. Zara Tapas Bar in Chennai and the Chennai City Traffic Police chaperoned Yamraj, the God of Death through a viral video on “Drink and get Driven“. Zara Tapas Bar shot a small video featuring guests drinking and having a good time with friends. When it’s time to leave, on receiving their car from valet, guests are in for a shock of their life, seeing Yamraj sitting at the backseat of their car. Yamraj warns them by handing over a “Drink and get Driven” information leaflet about hire-a-driver service. The video was posted on 15th Feb 2013, and went viral on Facebook, Twitter and Youtube within the next two days itself. Started from Zara Tapas Bar’s Facebook page, local fans started sharing the video with their friends leading to an avalanche of shares received. Owing to the social message and creativity of the video, it soon caught attention from viewers across the country. Today the video has 375,841 views, 1,630 likes and 100+ comments. The virality of the video also improved likes on Zara Tapas Bar and Chennai City Traffic Police facebook pages. What’s more interesting is that it was also covered by print media in Chennai by several local newspapers immediately the next day of it’s upload. There are two aspects for making a video go viral. First and the most important is the content. The subject of your video and how you present it, makes you stand out from the rest. The second being your “influencers“. Everyone shares and likes videos, but when done from influential people with greater outreach multiplies and widens your base. Try to hit the emotional cord of the audience and reach out to them in the most appropriate way, the message reaches it’s recipients. India being a God fearing nation, using Yamraj as a figure worked for the makers of this campaign. Awareness, the motive of this campaign was clearly a success.